In these Terms and Conditions of Sale, Landmark Ceramics, Inc., is referred to as “Landmark”, and the customer or person or entity purchasing Landmark’s products (herein referred to as "Products" and "Goods") from Landmark is referred to as the “Buyer”. These Terms and Conditions of Sale, and Landmark’s Order Acknowledgement constitute the complete and exclusive agreement and understanding governing the sale of Goods by Landmark to Buyer (the “Agreement”) and supersede all prior agreements, understandings or representations, whether written or oral, among the parties with respect to such matters. Provided, however, that if any term, provision or condition of Landmark’s Order Acknowledgement should conflict or be inconsistent with any paragraph of these Terms and Conditions, then the content of Landmark’s Order Acknowledgement shall prevail and control over such conflicting and/or inconsistent terms. BY ACCEPTING LANDMARK’S ORDER ACKNOWLEDGEMENT AND/OR INSTRUCTING LANDMARK TO SHIP PRODUCTS (EITHER BY FACSIMILE OR E-MAIL COMMUNICATION), BUYER WILL MANIFEST ITS ACKNOWLEDGMENT, ACCEPTANCE AND AGREEMENT TO THESE TERMS AND CONDITIONS. Landmark reserves, in its sole discretion, the right to refuse any order. No order is accepted by Landmark until: (i) Landmark provides Buyer with a written Order Acknowledgement, and (ii) Buyer duly signs the Order Acknowledgement in acknowledgement, acceptance and agreement, and returns the signed Order Acknowledgement to Landmark. All prices for Goods, including, but not limited to, those specified in Landmark's price list or schedule, website or written quotation, are subject to change without notice. Such prices shall be automatically adjusted to reflect Landmark's prices of Products as in effect at the time of the requested shipment date, and each shipment will be invoiced at such adjusted prices. Unless otherwise expressly agreed by Landmark in writing, all prices are EX WORKS (which shall have the same meaning as in the Incoterms 2000 published by the International Chamber of Commerce), exclusive of any applicable taxes, duties, sales taxes, transportation and insurance costs or charges (collectively “Charges”), which are to be borne exclusively by Buyer. Unless otherwise expressly agreed by Landmark in writing in Landmark’s the Order Acknowledgement , the purchase price for all orders shall be paid in full in advance of shipment. All payments must be made in U.S. currency. In the event Buyer fails to make any payment when due, Landmark shall have the right, in addition to all other remedies available to Landmark either at law or in equity, to either terminate this Agreement immediately, without notice, or to suspend further performance under this Agreement. Buyer shall be liable for all expenses, including reasonable attorneys' fees, relating to the collection of past due amounts. If any payment owed to Landmark is not paid when due, it shall accrue interest at the rate of the lesser of 15% per annum, or the maximum amount permitted by applicable law, from the date on which such past due amount is due until the past due amount is paid in full. Should Buyer's financial responsibility become unsatisfactory to Landmark, cash payments or security satisfactory to Landmark may be required by Landmark for future deliveries and for the Goods theretofore delivered. If such cash payment or security is not provided, in addition to Landmark's other rights and remedies, Landmark may discontinue deliveries. Unless otherwise expressly agreed in writing by Landmark, shipments are made EX WORKS (which shall have the same meaning as in the Incoterms 2000 published by the International Chamber of Commerce). Responsibility, risk of loss or damage and responsibility shall pass from Landmark to Buyer upon delivery the tendering the Products to carrier. Any claims for shortages or damages suffered in transit are under the responsibility of Buyer and shall be submitted by Buyer directly to the carrier. Shortages or damages must be acknowledged and signed for at the time of delivery. While Landmark will use all reasonable commercial efforts to maintain the delivery date(s) acknowledged or quoted by Landmark, all shipping dates are approximate and not guaranteed. Landmark reserves the right to make partial shipments. Landmark, at its option, shall not be bound to tender delivery of any Goods for which Buyer has not provided accurate shipping instructions. If the shipment of the Products is postponed or delayed by Buyer for any reason, including but not limited to, Buyer providing Landmark with inaccurate shipping instructions, then Buyer agrees to reimburse Landmark for any and all transport and/or storage costs and other additional and incidental expenses resulting therefrom. In case shipment is made FCA or CPT (which shall have the same meaning as in the Incoterms 2000 published by the International Chamber of Commerce) the Buyer is required to provide Landmark with all delivery instructions as well as any special delivery requirements which include, but are not limited to, residential deliveries, lift gate needs, limited access deliveries, lumper service needs. Buyer agrees to reimburse Landmark for any and all transport additional fees Landmark incurs, caused by lack of communication of special delivery requirements from the Buyer to Landmark at the time of freight quotation. in case shipment is made FCA or CPT (which shall have the same meaning as in the Incoterms 2000 published by the International Chamber of Commerce) all Products must be inspected at time of arrival for visible damages and Buyer must note on the Proof of Delivery “POD” any damages prior to the delivery driver departing. If Buyer discovers concealed damages or shortages after the delivery driver has left Buyer's premises and those damages or shortages have not been clearly specified on the POD, Buyer is required to notify Landmark’s Customer Service care department within three (3) days of the delivery in writing by e-mail to customercare@lcusa.com. Upon receipt of the claim, Landmark will initiate a claim with the carrier, but if nothing was specified on the bill of lading, Landmark cannot assure that the claim will be approved by the carrier. Damaged material should not be returned to Landmark without Landmark's written prior approval and it should not be disposed of or further altered in anyway. It should be clearly marked as nonconforming and stored safely until the claim is resolved which can take several months. In the event the claim is denied by the carrier, Landmark reserves itself the right to also deny the claim and request payment of the corresponding invoice without deductions. Subject to the limitations set forth in Section 6 below, Landmark warrants that Products sold by Landmark as “first choice goods” are manufactured in accordance with Landmark’s published technical standards. This limited warranty is valid only: (i) for a period of one hundred and eighty (180) days from the date of shipment of the Goods by Landmark, or (ii) for the period from the date of shipment of the Goods by Landmark until installation or attempted installation of the Goods, whichever is less. This limited warranty applies only to “first choice goods” sold by Landmark. ALL GOODS SOLD BY LANDMARK OTHER THAN “FIRST CHOICE PRODUCTS” ARE SOLD AS IS. THIS IS THE SOLE AND EXCLUSIVE WARRANTY GIVEN BY LANDMARK WITH RESPECT TO THE GOODS AND IS IN LIEU OF AND EXCLUDES ALL OTHER WARRANTIES, EXPRESSED OR IMPLIED, ARISING BY OPERATION OF LAW OR OTHERWISE, INCLUDING WITHOUT LIMITATION, MERCHANTABILITY AND FITNESS FOR A PARTICULAR PURPOSE WHETHER OR NOT THE PURPOSE OR USE HAS BEEN DISCLOSED TO LANDMARK, AND WHETHER OR NOT LANDMARK'S PRODUCTS ARE SPECIFICALLY DESIGNED AND/OR MANUFACTURED BY LANDMARK FOR BUYER'S (OR ANY SUBSEQUENT TRANSFEREE’S, AS DEFINED BELOW) USE OR PURPOSE. OTHER THAN REPRESENTATIONS OR WARRANTIES MADE BY LANDMARK IN ITS LITERATURE AND/OR PACKAGING, NO REPRESENTATION OR WARRANTY OF ANY KIND REGARDING THE PRODUCTS MADE BY ANY PERSON OR ENTITY INCLUDING, BUT NOT LIMITED TO, INDEPENDENT DISTRIBUTORS AND SALES REPRESENTATIVES, SHALL BE BINDING UPON LANDMARK. IF YOU ARE A CONSUMER, AND SHOULD ANY APPLICABLE LAW PROHIBIT THE DISCLAIMER OF IMPLIED WARRANTIES SET FORTH ABOVE, THEN ANY IMPLIED WARRANTIES FOUND TO EXIST WILL BE STRICTLY LIMITED TO THE DURATION OF THE LIMITED WARRANTY SET FORTH ABOVE. Notwithstanding the foregoing, this limited warranty does not extend to any losses or damages due to misuse, accident, abuse, neglect, normal wear and tear, negligence (other than Landmark's), unauthorized modification or alteration, use beyond rate capacity, improper installation, maintenance or application. To the extent that Buyer or its agents have supplied specifications, information, representation of operating conditions or other data to Landmark or Manufacturer in the selection or design of the Goods and the preparation of Landmark's quotation, and in the event that actual operating conditions or other conditions differ from those represented by Buyer, any warranties or other provisions contained herein which are affected by such conditions shall be null and void. Buyer must notify Landmark of any defects in the Products in writing, via certified mail to Landmark Ceramics, at 1427, N Main Street, Mt.Pleasant – TN, 38474, within thirty (30) days of Buyer’s receipt of the Goods. Upon receiving Buyer’s notice of defect, Landmark shall, at its option, repair, correct or replace the Goods EX WORKS (which shall have the same meaning as in the Incoterms 2000 published by the International Chamber of Commerce), or refund the purchase price for that portion of the Products found by Landmark to be defective. Failure by Buyer to give such written notice within the applicable time period shall be deemed an absolute and unconditional waiver of Buyer's claim for such defects. Goods repaired or replaced during the warranty period shall be covered by the foregoing warranty for the remainder of the original warranty period or ninety (90) days from the date of shipment, whichever is longer. Notwithstanding the provisions contained in the preceding sentences of this paragraph, Buyer shall be deemed to have accepted the Products and absolutely and unconditionally waived its rights to claim for any defects: (i) upon installation or attempted installation of the Products, or (ii) if the Products are otherwise used or altered in any way. Buyer assumes all other responsibility for any loss, damage, or injury to persons or property arising out of, connected with, or resulting from the use of Goods, either alone or in combination with other products/components. This Section 5 also applies in the event that any entity or person (other than Buyer) buys, acquires or uses the Goods, including, but not limited to, any entity or person who obtains the Products from Buyer (any of them a “Subsequent Transferee”). Buyer hereby covenants and agrees to provide such Subsequent Transferee with conspicuous written notice of the provisions set forth in Sections 5 and 6 of these Terms and Conditions of Sale, by providing each such Subsequent Transferee with a copy of the notice attached hereto as Exhibit “A”. Buyer, furthermore, covenants and agrees that it shall not make any representation or warranty whatsoever regarding the Products to any third party (either on behalf of Landmark or on its own account), other than the limited warranty of Landmark set forth in this Section 5. BUYER HEREBY COVENANTS AND AGREES THAT, SHOULD IT FAIL TO COMPLY WITH THE PROVISIONS OF THIS LAST PARAGRAPH OF SECTION 5, BUYER SHALL DEFEND, INDEMNIFY, AND HOLD LANDMARK, ITS OFFICERS, EMPLOYEES, AND AGENTS HARMLESS FROM AND AGAINST ANY AND ALL LIABILITY, LOSS, EXPENSE (INCLUDING REASONABLE ATTORNEYS’ FEES), OR CLAIMS FOR INJURY OR DAMAGES (INCLUDING, BUT NOT LIMITED TO GENERAL, CONSEQUENTIAL, INCIDENTAL AND PUNITIVE DAMAGES) ARISING OUT OF OR IN CONNECTION WITH BUYER’S OR BUYER’S EMPLOYEES’, AGENTS’, REPRESENTATIVES’ AND/OR INDEPENDENT CONTRACTORS’ BREACH OF THESE TERMS AND CONDITIONS OF SALE. THE SOLE AND EXCLUSIVE REMEDY FOR BREACH OF ANY WARRANTY HEREUNDER SHALL BE LIMITED TO REPAIR, CORRECTION OR REPLACEMENT, OR REFUND OF THE PURCHASE PRICE IN ACCORDANCE WITH SECTION 5 ABOVE. LANDMARK SHALL NOT BE LIABLE FOR DAMAGES CAUSED BY DELAY IN PERFORMANCE AND IN NO EVENT, REGARDLESS OF THE FORM OF THE CLAIM OR CAUSE OF ACTION (WHETHER BASED IN CONTRACT, INFRINGEMENT, NEGLIGENCE, STRICT LIABILITY, OTHER TORT OR OTHERWISE), SHALL LANDMARK'S LIABILITY TO BUYER AND/OR ANY SUBSEQUENT TRANSFEREES EXCEED THE PRICE PAID BY BUYER FOR THE SPECIFIC GOODS PROVIDED BY LANDMARK GIVING RISE TO THE CLAIM OR CAUSE OF ACTION. BUYER AND ANY SUBSEQUENT TRANSFEREE AGREES THAT IN NO EVENT SHALL LANDMARK'S OR MANUFACTURER’S LIABILITY TO BUYER AND/OR ANY SUBSEQUENT TRANSFEREES EXTEND TO INCLUDE INCIDENTAL, CONSEQUENTIAL OR PUNITIVE DAMAGES. The term "consequential damages" shall include, but not be limited to, loss of anticipated profits, loss of business opportunity, business interruption, loss of use or revenue, cost of capital or loss or damage to property or equipment. It is expressly understood that any technical advice furnished by Landmark or Manufacturer with respect to the use of the Goods is given without charge, and Landmark and Manufacturer assume no obligation or liability whatsoever for the advice given, or results obtained, all such advice being given and accepted at Buyer's own risk. Neither Landmark nor Manufacturer shall be liable for delays in performance or for non-performance due to acts of God; acts of Buyer; war; fire; flood; weather; sabotage; strikes or labor disputes; civil disturbances or riots; governmental requests, restrictions, allocations, laws, regulations, orders or actions; unavailability of or delays in transportation; default of suppliers; material fluctuations in the exchange rate between the U.S. Dollar and Euro; or unforeseen circumstances or any events or causes beyond Landmark's or Manufacturer’s reasonable control. Deliveries or other performance may be suspended for an appropriate period of time or canceled by Landmark upon notice to Buyer in the event of any of the foregoing, but the balance of the Agreement shall otherwise remain unaffected as a result of the foregoing. If Landmark determines that its ability to supply the total demand for the Goods, or to obtain material used directly or indirectly in the manufacture of the Goods, is hindered, limited or made impracticable due to causes set forth in the preceding paragraph, Landmark may allocate its available supply of the Goods or such material (without obligation to acquire other supplies of any such Goods or material) among its purchasers on such basis as Landmark determines to be equitable without liability for any failure of performance which may result therefrom. Buyer may cancel orders only upon reasonable advance written notice and upon payment to Landmark of Landmark's cancellation charges which include, among other things, all costs and expenses incurred to cover commitments made by Landmark and a reasonable profit thereon. Landmark's determination of such cancellation charges shall be conclusive. PROVIDED, HOWEVER, THAT ANY CANCELLATION MUST BE MADE BEFORE THE GOODS HAVE BEEN SHIPPED. For “Made On Order Products” (which means declared as "Made on Order" according current pricelist) and for “Custom Products” (which means Products manufactured upon request of the Buyer, not included in the current Landmark's pricelist), the cancellation made subsequently to the confirmation of the Order Acknowledgement will entail, from the Buyer, the obligation to pay Landmark the full due amount listed in the Order Acknowledgment itself. Buyer may request changes or additions to the Goods consistent with Landmark's specifications and criteria. In the event such changes or additions are accepted by Landmark, Landmark may revise the price and dates of delivery accordingly. Landmark reserves the right to change designs and specifications for the Goods without prior notice to Buyer, except with respect to Goods being made-to-order for Buyer. Except as otherwise provided in paragraph d) of Section 5 above with respect to warranty defects, any and all material which Buyer desires to return and which Landmark agrees to take back will be accepted only with prior written authorization and must be in full compliance of this Landmark return policy. No returns will be accepted for discontinued material and for products other than first choice products. Returns will not be accepted unless Landmark has first issued a Return Authorization Number. Only Landmark Customer Service Department can authorize a return, and all return authorizations must be in writing. No sales representative may accept the return of any products without such written authorization. Products may be returned to Landmark only after inspection by Landmark and after receipt by the Buyer of shipping instructions. Returns will be charged a minimum of 25% restocking fee (unless Landmark erred in filling the order) and will be limited to full and unopened cartons that have not been damaged or mutilated in any way. Shipping, handling, insurance, taxes, risk of loss and tariff charges for return products shall be borne by the Buyer. Buyer hereby covenants and agrees to defend, indemnify and hold harmless Landmark, its officers, directors, employees, agents, advisers, representatives and affiliates (collectively, the “Indemnitees”) from and against, and pay or reimburse the Indemnitees for any and all claims, liabilities, obligations, losses, fines, costs, royalties, proceedings, deficiencies or damages (whether absolute, accrued, conditional or otherwise and whether or not resulting from third party claims), including out-of-pocket expenses and reasonable attorneys’ and accountants’ fees incurred in the investigation or defense of any of the same or in asserting any of their respective rights hereunder (collectively, “Losses”), resulting from or arising out of: (i) Buyer’s breach of any provision or covenant set forth in this Agreement, and/or (ii) Buyer’s making of any representation to any third party regarding the Goods other than the limited warranty set forth in Section 5 above. Buyer shall not assign its rights or delegate its duties hereunder or any interest herein without the prior written consent of Landmark, and any such assignment, without such consent, shall be void. No change, modification, rescission, discharge, abandonment, or waiver of these Terms and Conditions of Sale shall be binding upon Landmark or Manufacturer unless made in writing and signed on its behalf by a duly authorized representative of Landmark or Manufacturer. No conditions, usage of trade, course of dealing or performance, understanding or agreement purporting to modify, vary, explain, or supplement these Terms and Conditions of Sale shall be binding unless hereafter made in writing and signed by the party to be bound, and no modification or additional terms shall be applicable to this Agreement by Landmark's receipt, acknowledgment, or acceptance of purchase orders, shipping instruction forms, or other documentation containing terms at variance with or in addition to those set forth herein. No waiver by either party with respect to any breach or default or of any right or remedy, and no course of dealing, shall be deemed to constitute a continuing waiver of any other breach or default or of any other right or remedy, unless such waiver be expressed in writing and signed by the party to be bound. All typographical or clerical errors made by Landmark in any quotation, acknowledgment or publication are subject to correction. If any provision of this Agreement shall be held invalid or unenforceable by competent authority, such provision shall be construed so as to be limited or reduced to be enforceable to the maximum extent compatible with the law as it shall then appear. The total invalidity or unenforceability of any particular provision of this Agreement shall not affect the other provisions hereof and this Agreement shall be construed in all respects as if such invalid or unenforceable provision were omitted. This Agreement shall be governed by and construed in accordance with the laws of the State of Tennessee without reference to its conflicts of laws principles. Buyer, Landmark and Manufacturer agree to submit all disputes arising out of or in connection with this Agreement to the exclusive jurisdiction of the State and Federal courts of the State of Tennessee, located in Davidson County. EACH PARTY TO THIS AGREEMENT ACKNOWLEDGES AND AGREES THAT ANY CONTROVERSY WHICH MAY ARISE UNDER THIS AGREEMENT IS LIKELY TO INVOLVE COMPLICATED AND DIFFICULT ISSUES, AND, THEREFORE, EACH SUCH PARTY HEREBY IRREVOCABLY AND UNCONDITIONALLY WAIVES ANY RIGHT SUCH PARTY MAY HAVE TO A TRIAL BY JURY IN RESPECT OF ANY LITIGATION DIRECTLY OR INDIRECTLY ARISING OUT OF OR RELATING TO THIS AGREEMENT, OR THE BREACH, TERMINATION OR VALIDITY OF THIS AGREEMENT, OR THE TRANSACTIONS CONTEMPLATED BY THIS AGREEMENT. EACH SUCH PARTY CERTIFIES THAT THEY HAVE NOT RELIED UPON ANY REPRESENTATION OR INDUCEMENT OF THE OTHER PARTY IN AGREEING TO THIS PROVISION AND THAT THEY FREELY, KNOWINGLY AND VOLUNTARILY WAIVE THEIR RIGHT TO A JURY TRIAL. The Convention for the International Sale of Goods shall not apply to this Agreement. All Goods sold to Buyer are subject to the export control laws of the United States and Buyer agrees not to re-sell or divert any Goods contrary to such laws. These Terms and Conditions of Sale create no third party rights between Landmark and any person other than Buyer, including but not limited to any Subsequent Transferee. It is understood and agreed that the parties do not intend that any third party be a beneficiary of these Terms and Conditions of Sale. RECOMMENDED USE FOR 9 MM THICK - MATT FINISH PRODUCTS (ALL COLLECTIONS) These products are recommended for indoor floors, walls, countertops, and outdoor walls in commercial and residential application. The use of these products is not recommended for horizontal exterior surfaces that require anti-slip features. Landmark recommends an offset no greater than 30%, If a staggered pattern is required for tiles of 20” inches or longer. Visit lcusa.com for detailed instructions of installation. RECOMMENDED USE FOR 9 MM THICK - HONED AND LUX FINISH PRODUCTS (ALL COLLECTIONS) These products are recommended for indoor floors, walls, countertops, and outdoor walls in commercial and residential application. The use of these products is not recommended for horizontal exterior surfaces that require anti-slip features. We do recommend not using the honed and Lux finish for wet areas where deposits of water are likely to occur. Landmark recommends an offset no greater than 30%, If a staggered pattern is required for tiles of 20” inches or longer. Visit lcusa.com for detailed instructions of installation. RECOMMENDED USE FOR 20 MM THICK PRODUCTS (ALL COLLECTIONS) These products are recommended for indoor floors, walls, countertops, and outdoor floor and walls in commercial and residential application. Landmark recommends an offset no greater than 30%, If a staggered pattern is required for tiles of 20” inches or longer. Visit lcusa.com for detailed instructions of installation. Do not apply any wax or sealer to the product after installation. Before grouting ensure that you apply a grout release when using honed or lux finish. Regular cleaning is the best way to keep honed or Lux tiles looking good. Use clean, hot water (add household cleaner for more aggressive cleaning). Rinse thoroughly and dry with a soft cloth to prevent water spots. Please visit lcusa.com. For further information regarding the care and maintenance of Landmark products. The use of the Lux finish is limited to wall cladding and floor application in residential venues and in spaces subject to low footfall, avoiding the direct contact with outdoor areas which require anti-slip features. After Grouting the Joints (pic. 1) It is important to remove the excess grout with a sponge and clear water (pic. 2). After 12/48 hours, the grout in the joints will have “set up”/hardened significantly. There will be a noticeable residual “haze”. Typically, a diluted acid cleaner specifically for removing “Grout Haze”, combined with a soft scrubbing pad will remove the majority if not all the “Haze”. Change your acid/water solution frequently for best results. It is also recommended to keep a bucket of clean water to remove the acid/water solution. It is recommended to keep and use clean dry towels to help remove as much residual water and keep the floor as dry as possible. Please refer to the cleaning chemical company’s suggested methods and dilution rates. (pic. 3). For areas with excess grout or grout that becomes adhered to the face of the tile, further cleaning with an Acid/Water Solution may be necessary. Please refer to the Cleaning Chemical Company’s instructions as not all acids or chemicals are the same. The excess grout residue (pic. 4-5) must be removed so that it does not dry and stick on the surface. It is necessary to change the cleaning water frequently and rinse well. Care must be taken on inlayed, polished and especially Anti Slip products similar to Frontier20. The use of a floor-washing machine combined with the use of a diluted acid detergent helps reach the spaces between adjacent tiles and clean them properly. If such a cleaning procedure is not carried out, or if such cleaning is carried out too late, the grout residue creates an absorbent film, which holds dirt, making the surface difficult to clean: in this case, Landmark Ceramics will not be liable for any damage caused to the surface. Ordinary maintenance must be carried out using specialized detergents to remove stains but these detergents must not leave a wax, film or membrane residue. Rinsing well with plenty of clean water is a fundamental part of the cleaning procedure, therefore we advise against the use of products which state that they “do not need rinsing”. Bright colored products, in particular white and extra-white tiles, are very delicate and, although for all intents and purposes are hygienically clean, they can get dirty more easily than darker tiles. It is therefore necessary to remember that these particular products require careful regular maintenance. Sealers are unnecessary. Sealing will change the D.C.O.F. (Dynamic Co-efficient of Friction) resulting in a surface that will become more slippery. Also because Porcelain has such a low absorption the sealer will unlikely stick and most likely the sealer will flake off over time. The above suggestions are a result of research, laboratory tests and several years’ experience. However, the cleaning features of the materials may vary significantly according to the different installation methods, conditions of use, types of surface and destination. As a general rule, the higher the anti-slip values of the tiles are, the greater cleaning inconveniences may arise. The professional operator in charge of maintenance and cleaning shall always check the surface condition before proceeding with any cleaning and/or maintenance operation (we would suggest to test some tiles before installation). Landmark Ceramics declines any liability with reference to cleaning and maintenance operations in case of heavy conditions of use (such as mechanical workshop or spaces presenting oily residues or tire marks), bad installation work or wrong cleaning operations. It is agreed that Landmark Ceramics shall not be liable for any event, damage or defect due to wrong installation of the tiles, faulty cleaning and maintenance operations or inadequate choice of the type of material to be laid or of the adhesives used in a certain destination of use. Landmark Ceramics recommends carrying out the procedures for the ordinary cleaning of Frontier20 floor surfaces using water and commercially available neutral detergents: the inclination of the surface and the space between adjacent slabs for dry-system installation favor the natural flow of water. However, it is important to take into consideration that any type of floor surface is subject to the surface tension effect of liquids: it is the same property of water that gives the tendency to transform into spherical droplets and which cause the curved top surface of a glass full of water. The surface tension can obstacle the complete drainage of water and cause a temporary stagnation of liquid on the slab edges. In order to avoid this problem, Landmark Ceramics recommends ensuring adequate inclination of the surface during installation so as to encourage the flow of water between adjacent slabs. Please remember in any case that, in view of the distinctive advantages of porcelain stoneware, Frontier20 absorbs practically no water, which makes it highly frost-proof. This may lead to localized water pooling, mainly on the edges of the pavers, independently of the manner and quality of the laying. Laying is also recommended with a minimum gap of 4 mm (5/32”). Should liquid deposit on the surface, it is recommended to push it towards grout lines using a brush or remove it with a wet and dry vacuum cleaner. Specific details and instructions are given for each of the following installation options. Different climates and geographical locations will affect the thickness of the base. Depending on the location, contractors will lay the standard base thickness to install porcelain pavers for the needs of the area. When installing porcelain pavers, the bedding course sand must be pre-compacted and then struck off with a screed to the required thickness as shown in the drawings. Before the laying of the porcelain pavers, the sand layer underneath must be pre-compacted. The sand layer needs a 5 to 6% moisture content to insure a smooth strike off finish. Compacting dry sand will not give the desired results. The use of plate compactors is not recommended to be used on the porcelain pavers. Polymeric sand-Polymeric sand is a blend of polymers which harden when subjected to moisture. Sweep the sand into the open joints until completely filled. All excess sand and dust must be swept from the surface. Use a blower for the final dust removal to make certain all excess sand is removed. Any residual sand or dust can result in staining of the surface. Once the filling of the joints and the cleaning of the surface is complete, mist the pavement with water which activates the polymer and cures the mixture. Porcelain paver pallets are shipped with a very strong plastic covering and the individual units are packaged in protective cardboard boxes. The protective cardboard boxes guard them from the possibility of chipping. The handling of multiple loose stones can result in damaging or chipping of the pavers. Protect any un-used boxed pavers from the elements once the plastic shipping cover is removed. This insures the integrity of the protective cardboard boxes. Wet cut paver saw is used to cut paver accurately and cleanly to fit around edges and corners. The saw must be equipped with a diamond blade manufactured for wet cutting porcelain and designed to safely cut a 24” (60 cm) length porcelain paver. A paver clamp to easily handle the installation and removal of pavers. Gloves are highly recommended while handling and installing porcelain slabs to protect the hands from injury. Notched trowels and grout float tools for cementitious adhesive and grout Installation. Follow the adhesive and grout manufacturer’s recommendations to select the appropriate tools needed for application. PORCELAIN PAVERS RAISED FLOORS INSTALLATION SYSTEMS: WARNINGS. Landmark products are made using the best technology available, and their technical performances match or exceed requirements from both ASTM and ISO standards for porcelain products. Nevertheless, if the application of the 20 mm slabs requires the ceramic product used in structural installations, the project engineer and/or customer must carefully assess the project requirements with regard to the technical specifications of the slabs. With regard to a raised floor installation a ceramic slab may fracture on impact if a heavy object falls on it from any significant height. Therefore the manufacturer recommends to check the specific intended use before starting the installation and to follow table for raised installation provided below. In certain conditions, reinforcing must be applied on the back of the slabs (double fiberglass mesh) supplied and applied by the manufacturer. Outdoor pavings installed unglued above the ground level are subject to the action of the wind, with the risk, in some cases, of becoming airborne. The manufacturer recommends to require the assistance of a qualified professional in order to check the suitability of the installation system above the ground adopted, in accordance with the local laws and regulations and the conditions of use. It is recommended to carry out raised installation onto a solid, resistant substrate with the correct inclination to guarantee water drainage. Support come equipped with four spacers that allow for the creation of grout lines between pavers. For a correct installation against walls or corners, it is necessary to keep the supports distant from the wall and remove 2 or 4 spacers as showed in the picture below. Landmark Ceramics recommends to strictly follow the instructions for the raised installation of Frontier20. Failure to comply with these recommendations may lead to improper use of the product and could cause serious property damage or injury. 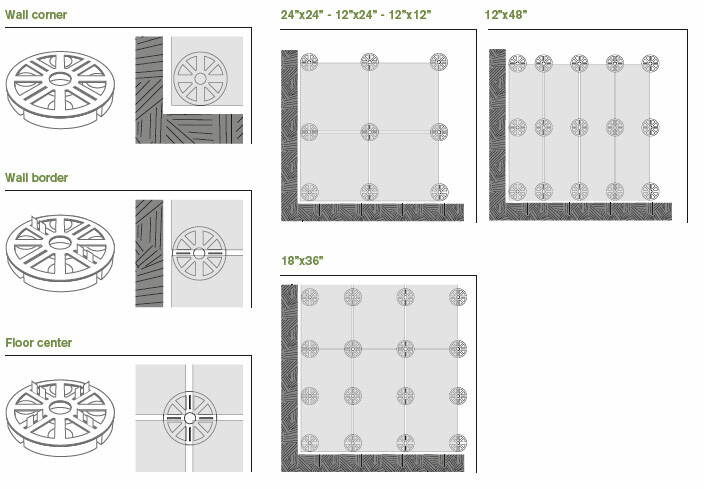 For further information and recommendations concerning the installation systems please refer to our website at https://hardscape.landmarkceramics.com. NOTE: For any detail and technical specification concerning the double fiberglass mesh, please contact Landmark Ceramics. Landmark is responsible only if it supplies the whole system (paver + double fiber mesh). Landmark cannot be held responsible for reinforcing systems not supplied by Landmark. In case of breakage, paver must be replaced immediately. Outdoor pavings installed unglued above the ground level are subject to the action of the wind, with the risk, in some cases, of becoming airborne. The manufacturer recommends to require the assistance of a qualified professional in order to check the suitability of the installation system above the ground adopted, in accordance with the local laws and regulations and the conditions of use. Failure to do so could result in serious injury or property damage. 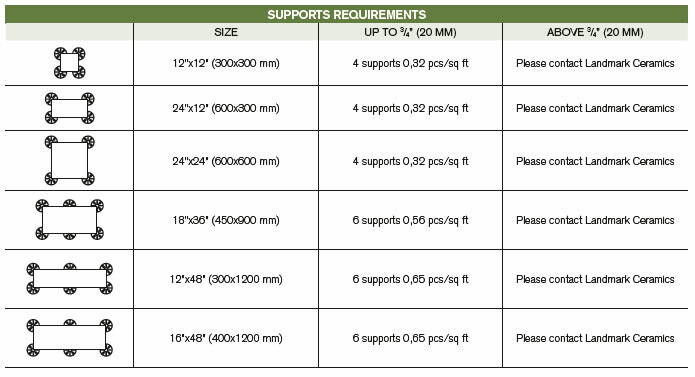 If the application of the 20 mm slabs requires the ceramic product used in structural installations, the project engineer and/or customer must carefully assess the project requirements with regard to the technical specifications of the slabs. With reference to a raised floor installation: a ceramic slab may fracture on impact if a heavy object falls on it from any significant height. Therefore to prevent the risk of damage or injury, Landmark recommends to check the specific intended use before starting the installation and to follow table for raised installation provided below. In certain conditions, reinforcing must be applied on the back of the slabs (double fiberglass mesh) supplied and applied by the Landmark. With reference to any dry installation system of flooring above the ground level: Landmark recommends to comply with local regulations and conditions of use with regard to wind- load, loadbearing, sismic events, etc. Failure to comply with these recommendations may lead to improper use of the product and could cause serious damage or injury. Failure to adhere to Landmark’s instructions for installation of slabs on raised pedestal systems may result in serious injury. For further information and recommendations concerning the installation systems please refer to https://hardscape.landmarkceramics.com website. All the information provided in this document can be subject to change. Please refer to our websites (https://www.lcusa.com and https://hardscape.landmarkceramics.com for the latest, most accurate and up-to-date information.